Jez Lowe is touring in New Zealand and Australia early in 2009 with special guest Kate Bramley. They’ll be at three festivals in Australia – Cobargo (NSW), Nannup (WA) and Port Fairy (Vic) and at several clubs and house concerts. Jez Lowe is touring in Australia and New Zealand for the next couple of months, taking in club gigs and festivals across New Zealand and Australia. Kate Bramley will be “special guest” on the tour, so audiences can expect songs from both Kate’s and Jez’s repertoire to be featured. Jez is known as a writer of excellent songs which are compassionate, whimsical, intensely lyrical reflections on life in the North East of England. 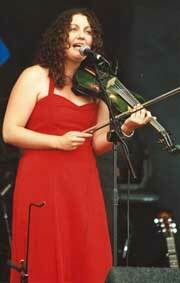 Though local in detail, they have universal appeal - and the melodies are irresistibly singable. 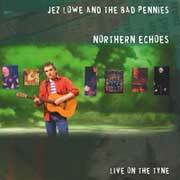 They'll be performing material from Northern Echoes: Live on the Tyne - the latest recording from Jez Lowe and the Bad Pennies. It was recorded live in Gateshead within earshot of the River Tyne. The songs were presented in a series of concerts titled A Song for Geordie (directed by Kate Bramley) which took back to audiences in Durham, Northumberland, Cumbria and North Yorkshire the songs Jez has been sharing around the world about the region. His own songs were performed alongside other songs from the wonderful on-going tradition of the North East of England. Some of the songs on the new CD are fresh versions of ones recorded on previous albums; some - like All Trawl, and The Sun and the Moon and Me - were part of a piece of theatre written by Kate Bramley. More gems are included on the DVD included in the Northern Echoes package. 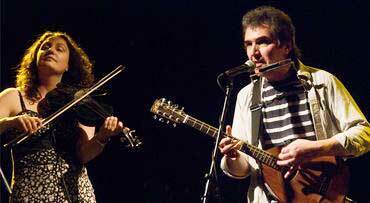 It includes clips from the various concerts with Jez, Kate and the two other Bad Pennies - Northumbrian pipe-player, Andy May and bass guitarist, David de La Haye - and also the two guest artists - Shona Mooney on fiddle and Benny Graham on vocals and melodeon. 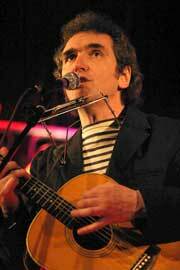 Benny's wide repertoire and honeyed tones make him a legend in the Newcastle folk scene. Archival footage enhances the emotive appeal of these additional songs - many traditional and some by other writers from the North East, including Tommy Armstrong, Alex Glasgow, Ed Pickford, Mark Knopfler. Following the tour down-under, Jez has a busy festival season ahead in the UK, with appearances at Whitby, Holmfirth, Wimbourne, Priddy, Saltburn, Shrewsbury, Sedgefield and Bromyard confirmed so far. He’s involved with other songwriters in the Darwin Song Project in March writing songs celebrating the 200th anniversary of the birth of Charles Darwin’s birth. They’ll be showcased at the Shrewsbury Festival in August. Jez heads to North America for festivals in late June. Kate's play - The Land Girls of Yorkshire - about the trials and joys of the land army during World War II - goes on tour in the UK in mid-2009. Web-watchers can hear a trio of old tracks from Jez’s years recording for Fellside at his MY SPACE site, as well as a clip from the NORTHERN ECHOES DVD “A Song For Geordie” that has recently appeared on You Tube, alongside a load of other clips featuring Jez and the band. CDs and songbooks are always available mail-order to anywhere in the world, often at bargain prices, via Jez's web site.